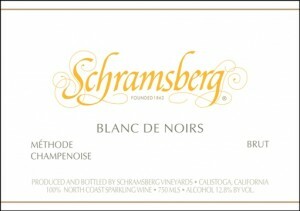 Schramsberg pioneered the blanc de noirs style in America, with the first release in 1967. Blanc de Noirs translates to “white of black” and is generally made from Pinot Noir grapes. Because of this, some blanc de noirs (like Gloria Ferrer) have a slight pink tint to them. But the Schramsberg version bears a clear yellow tinge. They source grapes for this wine from select cool-climate vineyards in four North Coast counties and the complex mesh of flavors shows off the effort. The 2007 vintage (these guys are unique in vintage-dating all their bubblies — most sparkling wine houses don’t to maintain a consistent recipe) has 74% Pinot Noir and 26% Chardonnay in the blend. This refreshingly bright, almond-scented, peach-laden sparkling wine tastes light with orange, toasted hazelnuts flavors and a tart lime finish. Stunning and worth the money. Occasion: Tasted at the winery and re-tasted recently when a kind soul (@fermented on Twitter) shared his bottle. Availability: Widely available at fine wine retailers. OR, skip the search and buy it online at Wine.com. Food pairing: Bubbles go with anything. Really.